Ponds, ditches, lakes, rivers and streams are important wildlife habitats in the UK – not least because some of the country's most endangered animals rely on them for their survival. One such animal is the great crested newt. One of three newt species in the UK, it can be distinguished from its relatives – the smooth (or common) newt and the palmate newt – by its rough, warty skin. Great crested newts are also much larger and darker in colour – and the males have a distinctive, dragon-like crest along their backs, giving them their name. All three species of newt are protected under the Wildlife and Countryside Act 1981, but the great crested newt is the rarest and most at risk. They have suffered a major decline in the last century and despite legal protection, their numbers continue to fall. A shortage of suitable breeding and resting places, and deterioration of existing habitats, is a major cause for this decline. 50 per cent of the UK's ponds were lost during the 20th century, and, of those that remain, 80 per cent are in a poor state. 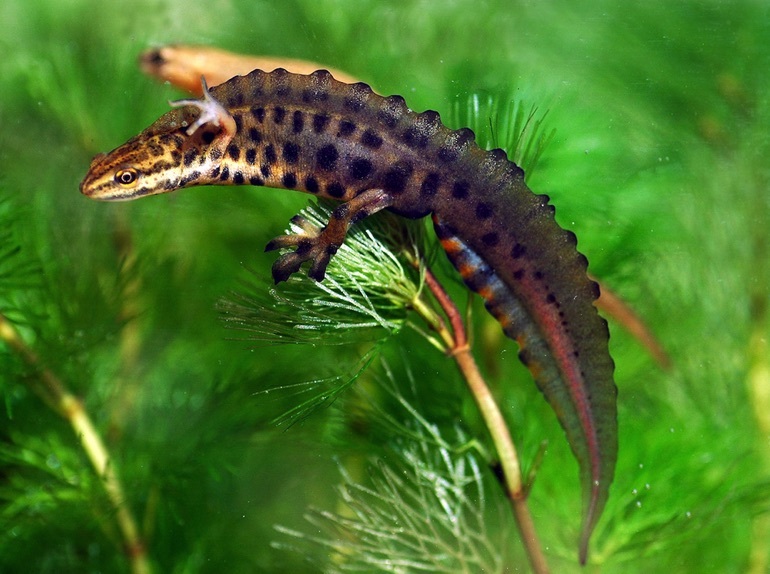 Newts prefer ponds in a warm, sunny position, as baby newts – known as efts – grow more quickly in warm water. Efts are often eaten by fish, so the pond should be free of fish. Ponds with weeds are ideal – the weeds provide hiding places for the newts, as well as a place for the females to lay their eggs. The area surrounding the pond is important, too – rough, undisturbed land nearby is essential, as great crested newts hunt in wild areas during the summer months. Newts hibernate over winter, emerging in February or March to return to ponds in time for the breeding season. They'll often hibernate in log piles, compost heaps and dry leaves – so be careful not to disturb them when tidying up around the garden. Having great crested newts in your garden pond can be a joy. But it's an offence to kill, injure or move newts – so it's important to know if you have them sharing your patch. It used to be time-consuming and complicated to find out if newts were present – often involving a search by torchlight, or looking for eggs. But thanks to the introduction of a new survey technique, that analyses DNA traces in water, it's now much quicker and easier to discover whether the elusive great crested newt has taken up residence. Environmental DNA (eDNA for short) is DNA that's released from animals' skin, faeces and mucus, and when they die. It's a fast and accurate way to determine whether great crested newts are present. This innovative survey method – in which water samples from ponds, lakes and ditches can be collected and analysed for environmental DNA – was devised following research led by the Freshwater Habitats Trust with Amphibian and Reptile Conservation. The information gathered can help build up a detailed picture of the distribution of great crested newts across the UK, so helping their conservation. Freshwater and wetlands are amongst the most threatened habitats in the natural world, but there's so much we can do to help the creatures that rely on these fragile, vulnerable environments – such as creating or preserving ponds. And if you already have a pond in your garden you can help with the conservation of other freshwater wildlife by getting involved with PondNet, a volunteer survey run by the Freshwater Habitats Trust that collects information about ponds and pond species – including rare plants and animals like the great crested newt.